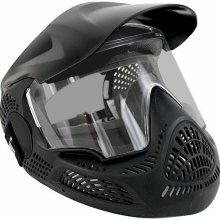 Planet's Rental goggle is great for any Airsoft or Paintball games. It is a great addition for anyone from a beginner to an experienced player. It provides a range of 160-degrees of vertical vision. The 260-degree of left to right vision facilitates viewing from various angles without having to move your head while playing. The wide range of vision and enhanced design of the goggle alleviates strain on your neck and head muscles. This paintball goggle is made with thermo-cured and anti-fog lenses, which improves visibility and is perfect for swift and non-contact play.